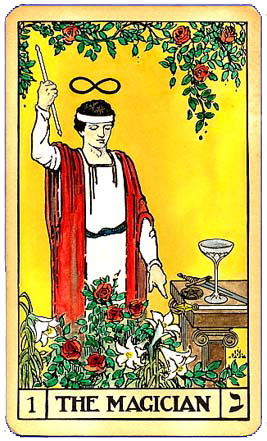 The Magician represents the life force as directed by the mind. Cloaked in passion and purity, he teaches us to manifest reality. Drawing his power from above, he is a transmitter of Divine Energy naming the elements of nature. Symbolic of air and earth, he is the figure of a scientist, an initiated master, a skilled illusionist. He knows that thought follows desire and that attention controls matter. Confer with The Magician whenever you want to construct a new reality, focus your awareness or improve your powers of concentration. The Magician image on journals, T-shirts, and mugs. Affirm: I Am Brilliant and Creative.